‘To Sing Away the Darkest Days’ is a fascinating collection of poems re-imagined from Yiddish folksongs. 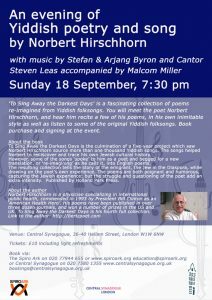 You will meet the poet Norbert Hirschhorn, and hear him recite a few of his poems, in his own inimitable style as well as listen to some of the original Yiddish folksongs. Book purchase and signing at the event. To Sing Away the Darkest Days is the culmination of a five-year project which saw Norbert Hirschhorn source more than one thousand Yiddish songs. The songs helped Norbert to rediscover and trace his own Jewish cultural history. However, some of the songs ‘spoke’ to him as a poet and begged for a new translation, or ‘re-imagining’ as he calls it, into English poems. The resulting collection tells the story of the emigrant, the Jew in the Diaspora, while drawing on the poet’s own experience. The poems are both poignant and humorous, capturing the Jewish experience; but the struggle and questioning of the poet add an extra intensity. Published by Holland Park Press. Norbert Hirschhorn is a physician specializing in international public health, commended in 1993 by President Bill Clinton as an ‘American Health Hero’. His poems have been published in over three dozen journals, and won a number of prizes in the US and UK. To Sing Away the Darkest Days is his fourth full collection.